Front side is liquid laminated for a high gloss finish. 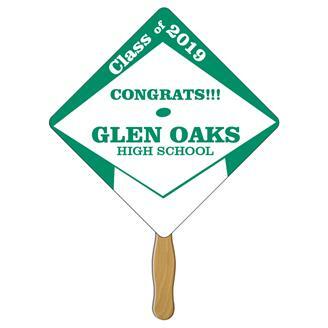 Stock shape shown with optional graduation graphics that can be modified to fit your needs. The backsides are perfect for autographs! Wooden sticks are glued (not stapled) to fan back for safety and appearance. White cap graduate fan made of high density 22 pt. white paper board. The front side is liquid laminated for a high gloss finish. Wooden sticks are glued (not stapled) to the fan back for safety and appearance. The backsides are perfect for classmates autographs!